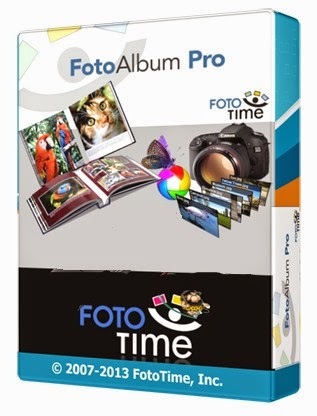 FotoTime FotoAlbum is an easy to use application that will help you organize your digital photos. FotoAlbum is simple for beginners to learn, but includes features to satisfy even the most advanced digital photographer. FotoAlbum’s Import wizard makes it easy to capture photos from cameras, scanners, memory cards, and other external devices. Create multi-level albums to better organize your library. Display your photos with the built in full-screen slideshow viewer. Enhance your images using red-eye removal, cropping, auto or manual color correction and filters such as Sepia, Oil-Painting and Engraving. Batch manipulations allow you to enhance, edit or rotate multiple images at one time. Easily create beautiful prints on your own printer. You can also order prints and gifts directly from FotoTime through our integrated online store and have them delivered directly to your door. FotoAlbum provides multiple methods to share you image collection. The built in e-mail client is great for sharing a couple of photos and can even resize them before sending. The FotoSync feature allows you to publish all or a subset of your library online for easy Internet sharing and online backups. The Device Sync feature can push photos to portable devices such as an iPod and PSP so you can carry your library with you. FotoAlbum’s advanced organization features allow you to build a searchable database of captions, keywords, dates, and ratings. EXIF and IPTC are fully supported and all metadata can be imported into FotoAlbum or exported into your pictures. FotoAlbum’s powerful filtering capability makes creating even complex filters simple and the same filters can be used to create smart albums which automatically update. Use the built-in archiving system to make sure your valuable work is not lost. FotoAlbum includes several features that make it easy to showcase your pictures including FotoShows, FotoCDs, slideshows, and screen savers. Image correction capabilities including red-eye removal, cropping, rotation and color / brightness and contrast adjustment. * Improved generating of the image CRC on startup. * Fixed problems with updating EXIF for RAF files.